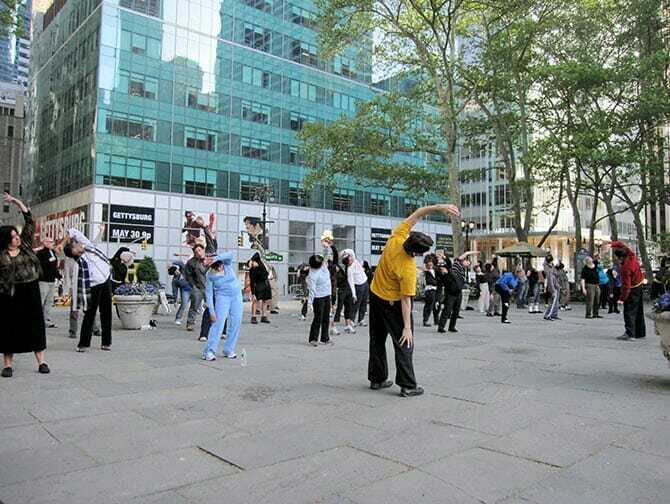 Like the yoga classes, it’s also free to participate in Tai Chi classes in middle of Bryant Park in Manhattan. Tai Chi is a movement sport that originated in China and aims at improving your physical and mental wellbeing. Lovers of this sport (or rather “art”) often train in large groups in parks and squares all over the world. The slow movement is very special to watch. From the 1st of May to the 30th of August 2018 there are free lessons every Tuesday and Thursday mornings from 07:30 to 08:30 in Bryant Park. Bryant Park is located in the middle of Manhattan. The class usually has between 30 and 70 enthusiasts who participate. Whether you’re 10 or 90 years, never practiced Tai Chi or are master, everyone can join for free. You do not need special clothes and the 3 teachers assist if required in the exercises. Classes are taught by the Tai Chi Chuan Center.